All Saints’ Church is holding a ‘Gift and Open Morning’ on Saturday 29th October, between 10am-1pm when the church will be open for visitors to make donations, make suggestions or just come and explore our beautiful building. Do drop in for refreshments; we will have bacon sandwiches on offer, along with coffee and cake! There will also be stalls as in previous years. It’s an opportunity to meet those who currently care for and work to improve your church and its local surroundings. It will be really good to see you and we would also love to hear your suggestions on how we might serve the village in new ways in the future. Joint Harvest Festival Service and Lunch, 25th Sept.
All are warmly welcome to join our Village Joint Harvest Festival at All Saints’ Church together with Haslingfield Methodist Church. Please note the 10:30 start and the service will be followed by a Bring and Share Lunch at All Saints’. 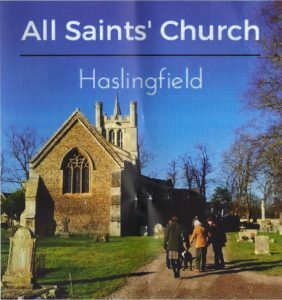 In organising lunch All Saints’ are bringing savoury dishes and Methodists are bringing the sweets – there is a list on the table just inside the church to check what others are bringing.